Marc and Jenny spent a LONG time looking for this little girl. We went through 5 different litters, hoping a girl would be the pick of the litter. When Tok (one of our favorite Vizslas of all time) was bred to Holly, we tried not to get too excited about bringing her home, but when the evals were finally done, Karma came to Denver. As much as Jenny tried to call her the princess, Karma proved as a puppy that being a spoiled little princess was NOT her thing! Karma is our little tomboy. She LOVES to be outside. When it snowed or rained, Indy would always “hold it” until his absolute breaking point before going outside. Karma on the other hand would bound out into a foot of snow to squat…all you could see was her head sticking out above the snow line. She still runs in the snow, rain, mud; whatever is in between her and a great time. Karma picked up her Junior Hunter title in 2010 at 14 months, (she picked up the first 3 at 8 months, then had to break for the off season) in just 3 tests and with 5 legs. She has a beautiful point and tons of intensity in the field, but patience (holding for the flush) was not her strong suit. In 2014, we found a few free weekends before a hunting test and were able to get a little bit of training in. We were thrilled to have her pick up her first Senior leg and decided to go for it. We traveled down to Texas over Thanksgiving and wrapped up her Senior Hunter title to close out 2014 in style. In the Spring of 2016, we took a couple weekends off of agility to try and pick up a couple Master Hunt legs while Halo was working on Senior. Karms was awesome. In 5 attempts, she was able to pick up 3 legs! Master is so hard and you (and sometimes the birds!) have to be so perfect, that we were THRILLED with those 3 legs that Spring. After the summer field break, we took Karma back out that fall and with a triple flush, two finds, and three honors, our little Karma made some Vizsla history! By finishing her Master Hunter title, she became only the 3rd Vizsla in history to achieve both Master titles — Master Agility Champion (MACH) and Master Hunter (MH.) In fact the other two are some of our breeds most famous — a quintuple champion named Chartay and a triple champion named Dart! Part of being a great agility dog is having some serious drive. Karma has it in spades. In fact, her prey drive was so strong, that we thought we’d try her in a Coursing Ability Test. CATs are modified lure coursing runs that basically test prey drive. Karma excelled and became the 1st female Vizsla in AKC history to earn the CA title. Love that drive, and love that we can earn an AKC title for it! In early 2012, we started Karma in Rally on whim. There was a three day trial and we wondered if she could get it done in a weekend — and she did! Despite learning how to down just one week before the trial, Karmie earned her title with flying colors and a high score of 97! And since we were going to be at Nationals, we put her in the Rally Advanced class, and despite the lack of training (bad humans) Karma read Jenny’s mind and not only qualified but took home 2nd place! With one leg in the bag, we brought Karma to a Rally trial in June 2012, and again, she qualified in 2nd place for her last two legs to finish her Rally Advanced title. In February of 2013, we received an email from the AKC; Karma’s scores in Rally Advanced were high enough to qualify her for the Inaugural National Rally Competition! Who knew?! With all the agility Karma was doing in 2013, we didn’t have much time to take a weekend off for Rally. We did find one Friday up in Cheyenne to pick up her RE leg, and then she finished out her last 2 legs at our club’s trial in January 2014. Nice to have all her Rally titles tucked away in such short order 🙂 Now we just enter Karma in RAE at the National Events and so far so good! She has 4 RAE legs, and we hope she can still play Rally at several more Nationals. From a young age, Karma showed an interest in Agility. So once she was old enough, we started taking her to class. What a natural and how lucky are we that she was our first agility dog! 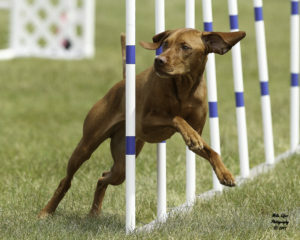 She picked up her NAJ title in March of 2012 to kick off her agility career. By Memorial Day, she had both of her Open (OA & OAJ) titles, and she was officially in the Master Classes by November. 2012 was finished with our first QQ right before the New Year! In 2013, Karma and Jenny were able to pick up 4 QQs and started getting much faster as a team. 2014 brought 6 more QQs and it was the first year that Karma qualified for the National Agility Championship. 2015 was our biggest year yet! Not only did she earn her qualifications for the 2016 NAC, but she was consistently ranked in the Top 10 Rankings! This is really hard to do when you don’t live in a state that has a trial every weekend. Luckily, Karma is a speedy monkey and what we lack in opportunity we make up for in speed! And the biggest achievement of 2015 — Karma earned her Master Agility Championship!! This was followed by a MACH2 in 2017 and our final year competing as a 20″ regular dog was Spring of 2018 where Karma took blue in all of her qualifying runs at the Vizsla National in Asheville. A great way to end a regular jump height career! These days Karma runs in the preferred classes and still lays down some blue ribbon worthy performances. For more about Karma, please click here to read about her adventures over the years.